Just when you thought you couldn’t love hoopla more! 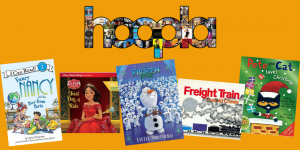 hoopla is one of the streaming services offered by Capital Area District Libraries. It was already utterly fantastic, with its huge selection of music, eBooks, audiobooks and movies, all available immediately. Now hoopla has gotten even better with the addition of read-along books for kids. The format is easy and engaging—a narrator reads the book aloud as the reader follows along with pictures and text onscreen. As each word is spoken, it is highlighted in red. It’s a great early literacy tool—and a less noisy alternative to some of the more obnoxious apps! There’s non-fiction, holiday titles, Caldecott winners and material for kids of all reading levels. Like everything else in the hoopla collection, these read-along books can be used on a desktop, tablet or phone. hoopla offers CADL patrons a generous 12 checkouts per month, with varying loan periods, and everything returns automatically with no overdue fines to worry about. Check out cadl.org/hoopla to get started.